I love Christmas!! That is no secret. And, one of the things I love most about Christmas are the MOVIES!! Above are some of my favorite Holiday Favorites. 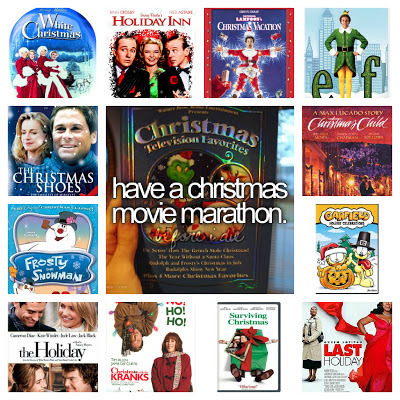 And, my goal is to watch all before Christmas Day!! 3. Christmas Vacation - Watched while we decorated our tree! 8. Garfield's Christmas - LOVE IT!! 9. The Holiday - LOVE IT!! White Christmas is my all-time favorite. When we were growing up, my grandparents had TWO VHS tapes at their house. White Christmas was one of them. My sister and I watched them year-round! Brings back the BEST memories.